RoDyMan, the pizza maker robot between Neapolitan and tech cuisine. 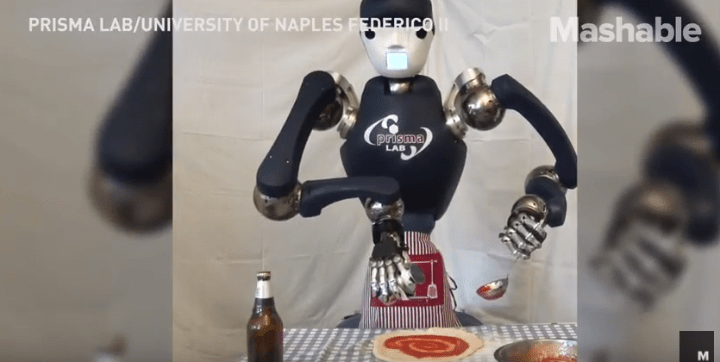 The ingredients of this incredible story are three: Naples, pizza and robotics. Ingredients that are well blended, have created RoDyMan, the first robot-pizza maker. It all started in the Prisma Lab, a laboratory of robotics at the Federico II University of Naples. Here is a team of engineers led by prof. Bruno Siciliano orders a pizza and has an intuition: to build a robot able to handle elastic, malleable objects. Like the pizza dough our engineers were snapping. And beyond the pizza RoDyMan, a.k.a. “The robot pizza maker”, represents a real evolutionary stage in robotics. And not only that because its fluid movements abandon the traditional rigidity of the robots, but also because its ability could be exploited in many other manual professions, even in healthcare (think of futuristic robot-surgeons). With an army of RoDyMan can definitively take the place of human workers? The professor. Siciliano assures that RoDyMan does not intend to replace man as much as to support him in certain activities. Not even meat-and-bone pizza makers, at present, seem to be particularly worried by RoDyMan, in fact they doubt that a sequence of robotic movements, triggered by algorithms, can replace the art of human pizza makers, born instead of emotion. And from that passion that seems to flow in their veins like the magma of Vesuvius. “You will not believe it but every pizza has a soul” says Gino Sorbillo, the best known pizza maker of Naples “a soul that changes from dough to dough”. And, for the moment, the queues that are miles away from its premises as well as the 150,000 employees in the catering sector hope for Sorbillo and his fellow chefs. However, the age-old art of pizza seems to have been handed down to RoDyMan, whose movements are modeled on those of the pizza maker Enzo Coccia, another veteran of the sector. Sensors have been applied to the chef to transmit every movement on a screen called an avatar. From this screen, which acts as a “mind” for RoDyMan, the robot stores them. And, as foreseen by prof. Sicilian, this year the robot pizza maker will have nothing to envy to his “colleagues” in the flesh, so much so that he can show off his skills at the Pizza Festival in May 2018. There, under the eyes of disbelieving visitors , will cook pizzas without skipping any preparation phase, starting from the dough and cooking. However, how much did RoDyMan costs? The professor. Siciliano does not hide a cost of hundreds of thousands of euros, which however has been rewarded with a loan of two million that has allowed the Prisma Lab of the University Federico II of Naples to recruit doctoral scholarship holders from universities all over the world. A beautiful trend reversal compared to Italian graduates who go abroad, which fills the prof. Sicilian and the Neapolitan university.